I bought some fresh cherries sometime ago and I wanted to use them up before it got spoiled. Fresh cherries don't come cheap here, you know. And although it is not Christmas time yet, it is already the Christmas month. And Penang doesn't have much Christmas mood, with just the occasional carol singing here and there. Well, it still doesn't stop me from baking something Christmas-y. And I don't fancy roast turkey or anything that tedious. 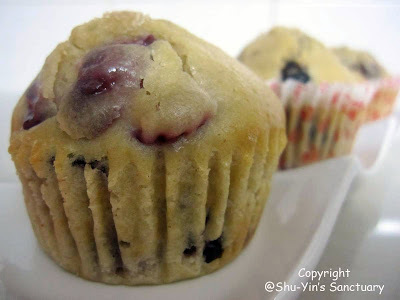 So I guess Christmas muffins is just for me - simple and yet Chrstmas-y! But to tell the truth, I don't really like the taste of this muffins. The fresh cherries made the muffins a little soggy, a thing which I hate. But the dried cranberries tastes so good in it. 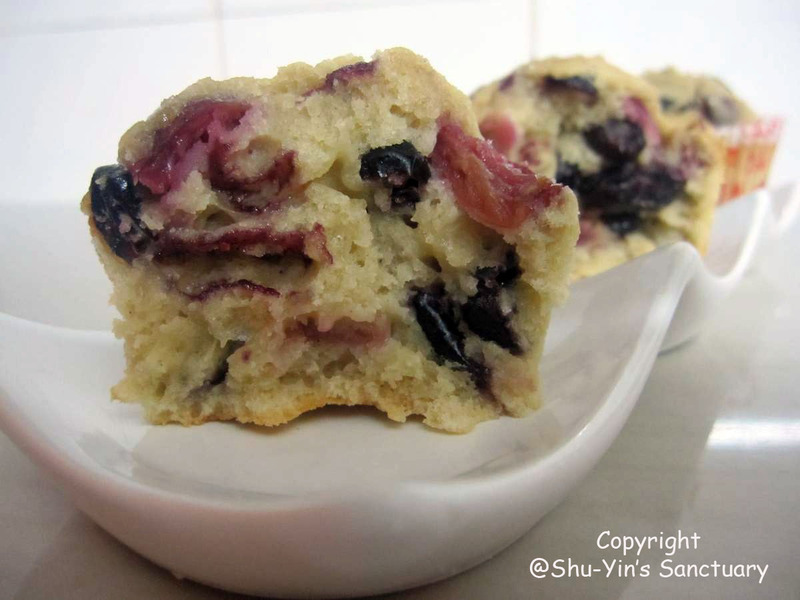 But if you don't mind dense muffins, the taste is rather nice. 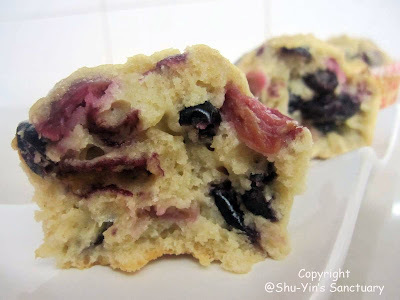 I love dried cranberries in any bakes. I love their chewy and tart yet sweet texture. 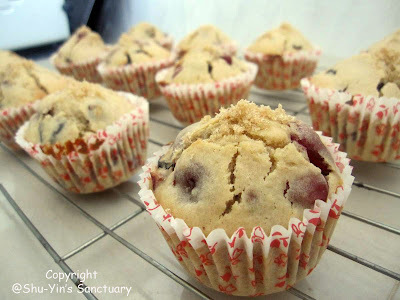 reheat oven to 190°C/375°F; line twelve 1/3 cup (80ml) capacity muffin pans with paper liners. Sift the flour, baking powder, cinnamon and salt into a large bowl, add the sugar and mix well. In a small bowl, whisk together the yogurt, egg and oil. Add to the flour mixture with the cranberries and cherries and mix with a fork until just combined – do not overmix. Spoon the batter into the prepared pans, sprinkle with the demerara sugar and bake for 12-15 minutes or until cooked when tested with a skewer.